Last Thursday I have been invited to the ZA new skincare range launch! Thank you so much Irene! Why am I excited? Because I have been a fan of ZA skincare and makeup since I was in high school. I have been using the True White skincare range for years. I have a good experience with the product. But then I move on to a other type of skincare because of my age. Since ZA launch this new skincare range that is infused with collagen. As right now I am pretty much obsessed with collagen skincare which I know its pretty mainstream right now, but yes, collagen have a lot of good properties for your skin. 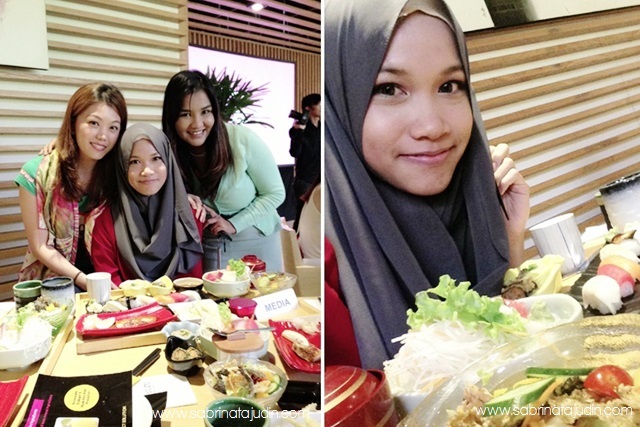 The event was launch at a Japaneses Restaurant called Yuzu. I pretty have lots of fun there. Especially the dish that was serve. Haha, I just cant imagine my self have that kind of service for my self! The food was pretty good but I am a lil picky when it comes to sushi. Only certain sushi I like but I am adventurous when it comes to food. I tried the raw fish and it actually taste good! I meet Kelly and Illy! Perfect Solution is a anti-aging skincare range that suits women from the early 20's. Its no harm to start an anti aging skincare rage actually. Its pretty much good for you. Focus on the main ingredient that is the Yuzu Citrus Seed extract and marine collagen. It helps to create firm, resilient and wrinkle-free* skin. Much advice to use the whole set of the range for better result. I started using this product today and will blog about it. In sya Allah. I never try ZA skin care before.. It is really nice, and I find it suits our weather and skin types! Since the main ingredient is collagen kan.. nice idea! I am ZA user too for their True White 2 way foundation! Would really like to try the collagen cream!!! the collagen cream is super nice, already use it foe a week now.